In a world where both traditional lighting and digital visual media are the domain of the modern lampie, On Stage Lighting considers the forthcoming release of media software Resolume 4 Arena which looks like it has potential in the small to mid scale show visual market. Here at OSL, we don’t really do product reviews and the following piece continues that tradition. In order to give you a look around the software, we finish up with a video poke about under the hood. This article simply looks at Resolume 4, which is in Beta 2 at the time of writing, from the point of view of a Lighting Designer/Programmer and asks if we should give the new Arena offering our attention. If you have some experience of media servers or the complexities of current projection and mapping trends, you’ll find some ideas on using Resolume 4 instead of your more familiar Arkatalyst Hippo Box software (see what I did there?). If you didn’t get that joke and have little experience of media servers in show production, read on anyway after checking this media server primer from a few years ago. What might we want from our media server? To precis, media servers are used on all kinds of show to play digital media which is then either projected on screens, the set, the floor, or even pixel mapped to starcloths or other low resolution outputs. They come as hardware/software or simply as software that you run on your own machine such as a decent spec laptop or desktop PC/Mac. Resolume is in the software camp and the interesting thing for us about Resolume 4 Arena is that they have added features to their Avenue VJ platform that are relevant to what we do. We will completely ignore the fact that it does quantised audio playback for simplicity today. Resolume has a setting to Hide Audio Controls, which clears thing up for us. 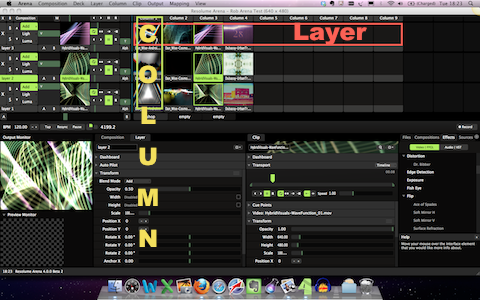 So what do us lampies really want from a media server and how does Resolume stack up? We’ll start with our typical Lampie Demands and see where it gets us. The ability to pick and mix video files and play them back whole, or in loops, or backwards or in a specific order. Resolume 4 Arena plays stuff back as you would expect. Unlike some other lampie media servers, it’s a little different to simply picking a media folder between 0 and 255, the picking a clip between 0 and 255. It does have the usual Play Modes: Forward, Backward, Bounce, Loop etc. plus Pause, Stop,yadda yadda yadda. The file/workspace you are working on at the time and the final output of your combined content. Within the Composition, a collection of layers and clips you’ve set up, that you can toggle between from the desk if you like. You could use a different desk per song, for example. If you are into media servers, you know what layers are. You can set the number of layers and drag and drop clips from your media folder onto slots on the layer. The difference with these layers, is that although they are numbered by default, the layer order is not set in stone and you can bump order around so a different one is “on top”. The layers have the usual Opacity and other manipulation controls such as scale, size, rotation and a whole bunch of others. The slots that you drag content in live in Layers on the X axis, but in columns on the Y axis. 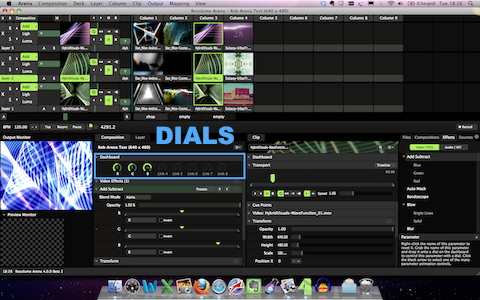 Now you might be starting to see that Resolume differs from things like Catalyst. Columns can be triggered ie. all the clips in all the layers of that column can be “Go”ed at once, firing off your final look of combined layers. You can also set the columns to auto fire along the line in a time you specify. You can bump the order of the columns…. uh oh…. so much choice…. These are the slots where your media file is put ready to play, in the Layer you choose and in the relevant column to taste. The file can be triggered by a Column or individually and get this, you can move the clip around within the Layer. Holy confusion, Batman. Fortunately, I don’t think you can do this from the console by default. So, unlike some media servers, Resolume Arena doesn’t so much have a timeline in the conventional sense but it does have options for the firing of cues, using pre set up columns is probably your best way. Either way, the flexibility in this means that you should decide on some kinda ordered system of how you use your layers and columns and clips and decks. And stick to it. Along with conventional video content, Resolume can also deal with Flash and Quartz Composer stuff, which is fandabbydozey because that kind of realtime rendered content is just loverly and opens up huge possibilities that don’t rely on particular videos of particular resolutions. To be able to layer, mix and generally mess about with video content, to come up with something original and fitting the visual look of the show. We want to be able to muck up the 4 loop clips we have in so many ways, so that it looks like we have endless content hidden back there. OMG. Forget scaling and rotating, the tools you have for manipulating content at every level, Composition (output level), Layer and Clip are like having real time After Effects that you can plug in wherever you like. With the standard manipulations such as scale, you have constant access to them from the console but the fun starts when you look at plugging in your effects such as Colour Shift or Waves. These effects can hit any level, can be applied in different orders and you can assign certain parameters to the eight Dials at the top of the Clip, Layer or Composition tab. This translates to dials on the console, meaning that in one instance, an encoder could be controlling Red level of a Layer, the next could be tweaking the Noise or Mask across the whole Composition. If you can’t get a whole show outta 4 clips and all this visual trickery, you ain’t trying. The key point is, again, you need a structured approach and to spend some time setting up what you want to be able to control. And keep it simple. My suggestion would be to assign Add/Subtract Colours Red, Green and Blue at Layer Level to your dials, giving you the option to blend your visuals into the rest of your stage look. If we wanted to play an hour long piece of edited content, we could simply make up our video and get the boys out back to press play on the ‘ol Beta tape machine. This millennium, we want to be able to busk our visuals live during the show. There are people that do this, they are called Video Jockeys (VJs). We would like to be like them, please. We’ve done it with a rig full of moving lights, how hard can it be? As with moving lights, how you play back your show live is entirely up to you. 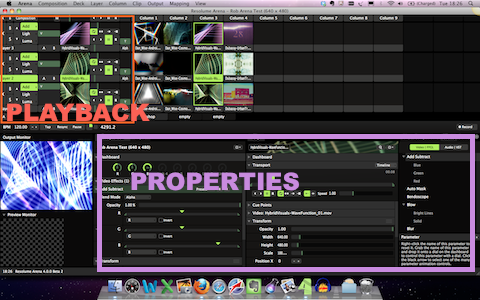 Resolume 4 is good enough for VJs, it can work for us lampies too! We want to be able to use our nimble fingers to wiggle faders and bump buttons right at the lighting control surface. We want to control the world with our GrandXZY Hogolites VII, every atom in the venue directly connected to our wheely wheely encoders and fondly touchscreens. Resolume Arena allows for both ArtNet control and via the Enttec USB DMX Pro box, so no excuses for not being able to plug your desk into it. If you so inclined you could follow the lead of some big gig LDs and use a cheap MIDI interface with keys, knobs and faders. Or use SMPTE timecode to trigger your stuff. The choice is yours. Not only that, but you can map any DMX channel to any attribute by setting the software to listen and sending that channel while selecting the attribute. Oh no, more choice. Luckily, the Auto DMX Map facility sets our channel mapping in stone so that it ties up with available fixture personality files and means you have some kind of stationary point in a turning world. The composition (remember, the overall output) uses 28 DMX channels and each Layer requires 37 channels, both include the all important 8 Dials as well as their various options. I’ve been using the MagicQ with the default personality file and it works well enough with Avenue 3.x, although I might make some changes to create my own custom personality to reflect my workflow. These would be to move things like Dial 1 – 3 (which could be Colour) to the Colour mixing area of the desk meaning it appears in the right place for me and can take part in any colour mixing shenagins I care to throw at it. By default, an awful lot of the parameters are accessed under Beam because they have no set function until you decide how you are going to run your show. At the time of writing, the beta 2 version of Arena 4 needs work as the DMX Auto channel mapping is muddled up. 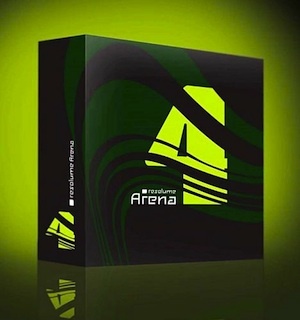 Resolume tell me that they are working on this and as Avenue 3.x works fine, I’m sure it’ll all come out in the wash.
*Update: The full release of Arena 4 DMX Auto Map includes extra channels of DMX control for both the Composition and Layer fixtures. This means that a DMX personality file created for Avenue 3 will not work as expected, you will need to use an updated file specifically for Arena 4. We do not want to wait, we need to press buttons now and see results yesterday. This should work if I press that. Don’t worry I know what I’m doing, I can’t possibly break this, I remember saltwater dimmers, y’know…etc. We also want it to be affordable and not involve piles of expensive kit that we don’t already own. It’s all very well for PRG, we just can’t afford vast warehouses stuffed with throbbing rackmount media wotsits. We do have a Macbook, however. My seven year old has worked out how to get a clip onto a layer and set it’s opacity, before adding another clip and adjusting the colour or jitter. Everything in Resolume is super intuitive, you drag things into position, drag effects into where you want them and even drag parameters on the those magic six Dials. I’m a lampie and even I can work this. Having used some pretty unsexy media server interfaces, I can say that I really get on with this. However, that’s in the software interface. What about the lighting desk? Here’s the rub. Resolume 4 does not currently seem to support MSEX or CITP or whatever it is that you like to send your media thumbnails between your server and your lighting desk. You can see why this might be hard to implement. Given that you can fire stuff at Column and Clip level and that you can reorder clips and layers and columns, where exactly would it get it’s thumbnail from? This is easy when all you have is Folder 254, Clip 127 but I assume it’s less easy when what you are about to output is not based on the media file itself, but the result of a media file that lives in a bucket such as a Clip, Layer, or Column. But still, this means when looking at the console you are not looking at a bunch of pretty pictures. And we like pretty pictures, we are visual people. Given that many other of our current media servers can do this, and that lighting consoles are often equipped with enhanced media server control areas, this seems like a weakness in an otherwise strong offer for us. Time spent deciphering text legends, or heaven forbid, looking at the software, is time spent not looking at the stage or the control surface. Being software based, Arena is priced at a point that brings it within the realm of an owner/operator LD that wishes to bring a bit of extra something to their clients without major financial commitment. Let’s face it, you don’t get paid extra to bring these goodies, they just give you the edge and make a show that is better than just OK. You get booked next time. One day, lampies decided that they didn’t know much about big LED screens or things with many pixels but they did understand starcloth, RGB LEDs and a way of turning that into a huge telly using an ArtNet network to transmit lots of DMX universes to an array. This mapping of digital content to a lo res grid of starcloth-like pixels became known as, er, pixel mapping and gave rise to actual products that made your stage look pretty. Resolume isn’t designed to be a pixel mapper and I’m not sure if I see why they would need to add that feature. We have stand alone mapping systems that take a video input, plus things integrated with lighting consoles that serve our needs. Pixel mapping as we know it at the moment is dependent on the fashion for particular bits of output kit and while it’s principles can be used to create lighting effects as well as send pretty pictures to large arrays, this is not what Arena is for. We want to do things Vidiots can do. We‘d like to make big screens out of multiple projectors without having to learn complicated videoperson software or pay for for said videoperson to eat into our fees and drink our coffee. We want to map bits of our mind-bending visual vomit to funny shaped things strewn all over our stage. We do not like boring 4:3 projection screens, they are for Powerpoint. The possibilities of edge blending (using multiple projectors to create one large picture) and projection warping/mapping (projecting onto strange shapes) is where my interest in Resolume Arena began. Given it’s price point of less than 700 Euros, it’s seriously attractive as these features are often found as add-ons to already expensive hardware or software. So what can it do? Within the Advanced section of the Output settings, you have control over your final input to the , er, Output stage. This is your Composition, the result of all your hard work of layers etc. output as a single picture. You can slice up this input picture, eventually sending different portions of it to your connected screens (video graphics outputs). These can overlap and you can apply a soft edge to them, meaning you can edge blend as you stitch the results back together again with your projectors. The other side of this Advanced output is, er, the actual Output stage. This is where you assign the slices of your input to an actual output which is assigned to a real world video graphics output. These outputs slices can be manipulated too, stretching and skewing, mapping them to your final surface which could be a rectangular screen, a curve or even an angled funny shaped thingy. The way that you can slice up the inputs, assign them to an output and overlap them means that you have very simple but quite powerful control over your mapping. Being able to overlap the input stage, and then send that to different parts of an output stage enables you to be able to edge blend across something as cheap as a Matrox TripleHead To Go. Or get a seemingly flat image across multi angled surfaces. Cool beans. You can save the output settings to a preset. It would be great if you could recall presets as part of your show running, allowing for changes in projection set up. At the moment, this is a set and forget job. They are currently offering a pre-New Year release discount on the pre-sale licence price, which added to the educational discount, made it an offer too good to refuse for me. I have students that want to know about this kinda thing and money is always tight. As an early Christmas pressie, I’ve been living with Arena for a couple of weeks now and I can already see potential in markets that we all understand. Content, live manipulation, mapping, blending, it’s the kind of thing I’ve been trying to do on the cheap for clients since before anyone had heard the term projection mapping. It was hard to sell, even using existing kit with a bit of ingenuity and creativity. No one could see the point and kinda smiled and changed the subject. Now, everyone is on this particular page, they all want their shows to look like “that thing off the telly.” Sure, if you are used to a particular media server, you might have to look at the world a little differently from time to time. If you are in the business of creating visual stage magic without access to boundless budget and racks of hardware, Resolume 4 Arena could be the very thing that you were looking for. Just thought I’d mention it. *Stop Press: The day following publication of this preview Resolume 4 was taken out of Beta and is now available as a full version for all users to trial. Great stuff. Great write-up Rob! I guess I’ll have to check into yet another video manipulation app….You’re characterization of the ‘video person’ nonchalantly drinking everyone else’s coffee whilst the lampies run around trying to pixelmap their visual vomit all over the stage is spot on! Though as a recovering lampie myself, I can appreciate a good piece of software that can allow people to do ‘what the vidiots do’. Cheers! Video really helpfull Rob. Using this on a show coming up. From reading Resolume Arena manual, forums, and this article, I am still unclear if Arena can be used to *control* DMX, for example, if I am a VJ playing blue underwater videos and I want those videos linked to trigger blue lighting via DMX, can I do that? The manual makes it sound like Arena only accepts DMX *input*. I don’t want to control Arena software via a lighting board, I want to control DMX lighting via the software! You could use another protocol to ‘control’ lighting from Arena but you’d still need a lighting control to do the work of controlling the fixtures, triggered from Resolume. 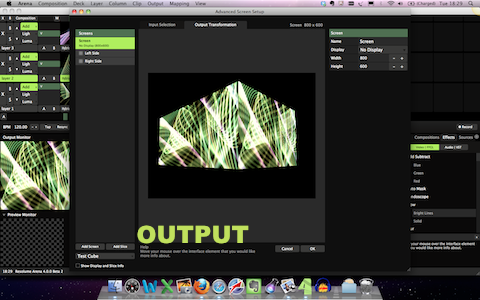 If you want to pixel map the output from Resolume onto a LED array, you’ll need something that will do the mapping and spit out ArtNet. For some interesting ways to OUTPUT DMX from video and other inputs, you could look at LightJams.